The Hunter Medical Research Institute (HMRI) is a medical research institute based in the Hunter Region of New South Wales, Australia. Internationally-recognised translational research outcomes are being achieved in asthma and airway diseases, cancer, diabetes, mental health, nutrition, pregnancy and reproduction, stroke and more. Collaborations are being conducted with institutes on all points of the globe. HMRI provides vital funding and facilities to fuel research, but the heart and soul of the institute are people – the researchers, the generous donors and supporters, the committed volunteers, and the patients who participate in trials and ultimately benefit from the research results. Who can become an HMRI Affiliated Researcher? Access to HMRI Connect - the HMRI intranet used to share news and information about funding, events, seminars, building updates and research support services (FES). To be eligible for these services you must first register as an HMRI Affiliated Researcher. Registration is open to the employees and contractors of the University of Newcastle, the Hunter New England Local Health District and the Calvary Mater Newcastle who are currently active in health and medical research, or would like to develop their research capability. To register your interest in becoming a HMRI affiliate, please complete the form below. We will then assess your application and if eligible send you a comprehensive survey to complete your application. If you receive emails from HMRI you are already registered as an affiliate and there is no need to register again. If you have any questions regarding registering as an affiliated researcher or about the HMRI services available to Hunter researchers please contact Ellie McNamara. 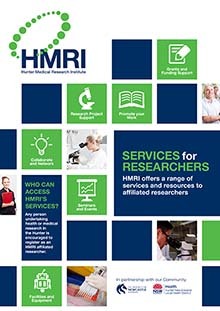 HMRI offers a range of services and resources to affiliated researchers. The services described here are only available to registered HMRI affiliated researchers.